Yes, I have to admit – my laptop is an old one. And yes, I never cleaned it up. New apps here, new data there. But I always thought that with 237 GB I’d be fine for a while. 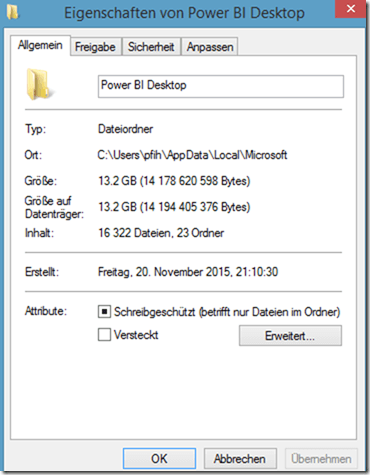 Instead, Power BI consumed my hard disk space! Today something weird happened. A query crashed. Being in the middle of downloading something about 360’000 rows from the Internet, an error message appeared (sorry, the message is in German). It says, that I‘m running out of storage. Ok, I aborted the query and began to clean up all the mess on my laptop. Problem solved! But hey, what happened? And what has PBI Desktop done to my storage? Power Query stores data on the Hard Disk in path C:\User\USERNAME\AppData\Local\Microsoft\Power BI Desktop\. All right, more than 13.2 GB….. What a mess. But which share contains the most data? 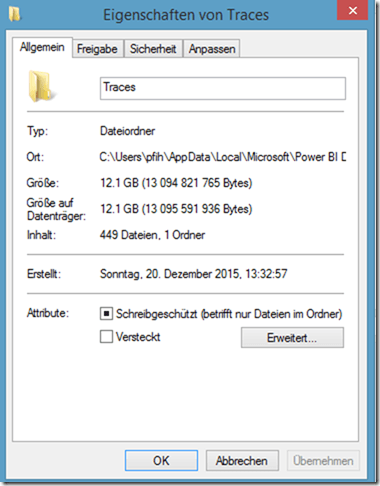 Ah, more than 12 GB are stored in “Traces”. Let’s dive deeper into that share and look what is inside. Uppsala, there are files going back to 2015. And the largest files consume almost 3 GB. Obviously I don’t need them anymore, so let us delete the oldest file. And voilà, after restarting the query, everything works fine. Clean up your laptop regularly! 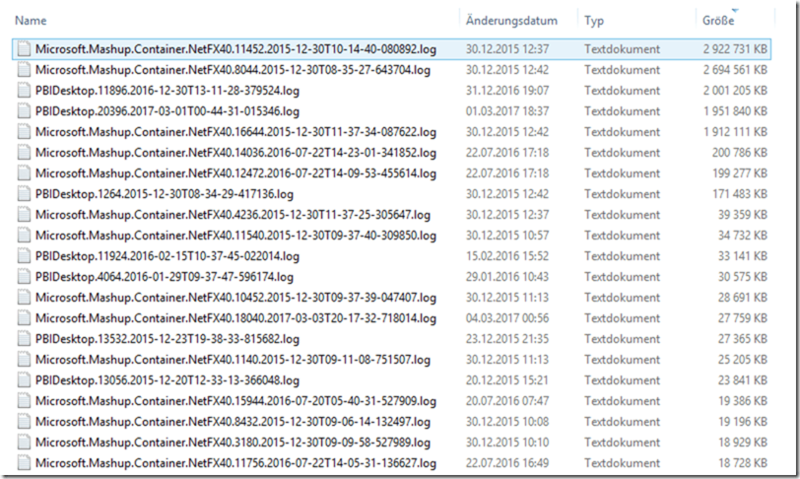 And tidy up the PBI Desktop log files from time to time.